We offer our customers beef and chickens and eggs. We tend our animals with respect and gratitude. We believe that meat raised on our farm is the best you can find anywhere. 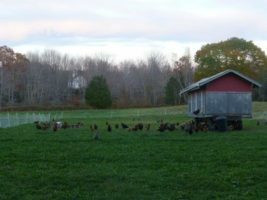 We feed certified organic grain to our chickens and never give any animal hormones or antibiotics. The animals enjoy a “natural” life, doing whatever activities their species prefers: grazing, rooting, scratching, taking a dust bath, etc. The taste and quality are far superior to any feedlot or factory-raised animal but the impact on the environment is also to be noted. All of our animals benefit our farm system. We use their manure, and/or ability to weed and till the soil to enhance the diversity of our farm. These animals live a healthy, outdoor life.